I have been trying to move a Godaddy email account to the desktop email client Thunderbird for the last 30 minutes. The main problem that I have with Godaddy's website in general is that it is rather messy, with hundreds of links and menus. What you need is usually hidden deep inside a complex navigation structure. I finally managed to get the email account working, and thought I'd share my findings with the world to make it easier for everyone who wants to use a Godaddy email account in an external email client. This will actually work with online email services that allow the configuration of external email clients as well. I think Gmail and Hotmail offer that feature, let me know if I'm wrong on this. The biggest problem for most users is the fact that Godaddy uses different incoming and outgoing servers based on the location of the user in the world. Godaddy operates US, European and Asian servers and the user has to configure the right servers for the email to work. The username and password of the email address should be fairly obvious. If you have forgotten your password you can change it in Godaddy's interface (by logging in, then Domains > My Account > Email). 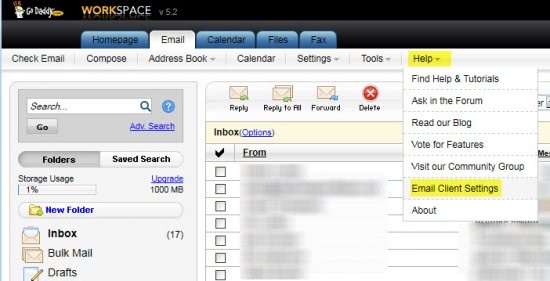 There you can manage existing email accounts and create new ones if you have credits left. A small overlay window appears that lists the incoming (pop3) and outgoing (smtp) server. Now it is possible to add the Godaddy email address to an external email client so that emails can be received and composed in the software. Thanks for this info. In my online GoDaddy e-mail account I created my own archive folders, however I have not figured out how to make them synch with the desktop client (I tried Outlook and Thunderbird). I don’t know if it is something I didn’t configure properly, or if it simply isn’t possible to do. I have not used that feature since I use Thunderbird exclusively. I do not think it is possible to sync folders though. Folder sync is only available with IMAP accounts. It’s not a feature of the POP protocol.